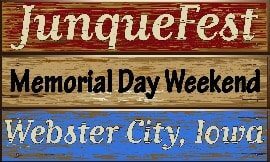 Soldier Creek Winery will be back at JunqueFest in Webster City, IA Memorial Day Weekend! Visit our booth! Mark your calendar for Memorial Day Weekend 2019 – in downtown Webster City! You’ll find the best in Primitive, Vintage, Repurposed, Yard Art, Rusty Finds, Architectural Salvage, Up-cycled items, Painted Products, Hand Made and more…! !